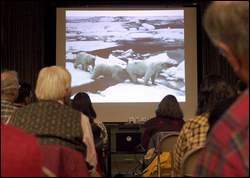 Aaron Leclerc/Staff photographer Viewers listen to a presentation on the conditions of the Arctic on Friday night at St. John's Episcopal Church in Portsmouth. 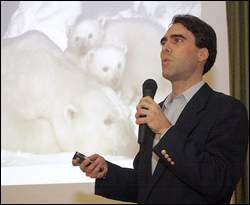 The event was part of the Polar Bear Survival Tour and was held by the St. John's Stewardship of the Earth Committee. Arctic explorer and author Chad Kister, below, talks to the group about current climate issues during the event. PORTSMOUTH — Adventurer, activist and author Chad Kister was just 21 years old in 1991 during his first solo adventure into the Arctic. Since then, he has been back three times, most recently in 2005, and the changes he has seen have been dramatic. Kister shared his experiences, his fears and his hopes with a group of about 45 people at the St. John's Episcopal Church Parish Hall on Friday night as part of his Polar Bear Survival Tour. Having witnessed first-hand the negative impacts of oil drilling and climate change in the fragile region, Kister is able to bring the experience to people all around the country through his slideshows, stories and videos. "Once I saw the land and stayed with the native peoples I realized the importance of this issue," Kister said. "It was a great adventure with a deep purpose behind it." Using stunning photos and first-hand accounts, Kister described how oil companies have devastated the ecology of the region, and how future development, along with climate change is threatening to kill off many species, including polar bears, walruses, and many birds and fish. An avid fishermen, when Kister embarked on his first 90-day journey he brought only 10 days worth of food, expecting he would easily be able to catch fish throughout his journey. He started in Prudhoe Bay, where automatic oil pumping stations had leaked toxic waste into the surrounding waterways killing off fish populations and Kister was forced to find edible plants for survival. Central Arctic caribou herds have been massively displaced by development around Prudhoe Bay also and are so toxic, that native people will no longer eat them, Kister said. The Arctic National Wildlife Refuge is one of the only places left on earth with all of its original inhabitants, including muskox, caribou, a wide range of birds and fish and of course, polar bears. Proposed oil development is right on top of the muskox range and would leave a permanent destruction of the habitat, Kister said. In addition, oil companies routinely crush polar bear dens, who are suffering in many other ways and are expected to be added to the endangered species list any day. As the Arctic ice rapidly melts, polar bears continue to lose their habitat and toxic waste in the drinking water is killing them as well. Walruses may also soon be added to the list, as the pack ice they rely on quickly recedes. Salmon breeding grounds are threatened as water temperatures rise, Arctic Char are threatened by proposed oil development which would bisect the rivers in which they thrive, caribou are losing land and the list goes on. "This is not a secure way to get energy," Kister said about drilling in the Arctic Wildlife Refuge. But the oil companies keep trying, despite the fact that it would only affect the price at the pump by about one cent, Kister said. And what happens to the Arctic affects us all, he said, adding that as the ice melts, more of the sun's heat is absorbed into the earth instead of being reflected back. As permafrost melts, fossil fuels escape into the atmosphere, including carbon dioxide and methane. "There really is no question anymore that we are the ones causing these crises," Kister said. A 2004 Pentagon report called climate change a more serious problem than terrorism. Current estimates by NASA scientists are for an ice-free Arctic Ocean as early as 2012, something the planet has not seen for a million years. Kister said one of the scariest things he hears as he travels around the country, generally by train or bus, is that people think it is too late to do anything about the situation. He offered simple solutions for people to take action into their own hands, including using more energy efficient light bulbs, using more mass transit, weatherizing homes and writing constant letters to senators and representatives. Kister also recommended boycotting Shell Oil, which recently purchased a lease in the Western Arctic that would destroy prime polar bear habitat. The Polar Bear Survival Tour was presented by the St. John's Stewardship of the Earth Committee as part of its Down to Earth Series, which has offered forums and multimedia presentations on the environment, with a specific focus on the problem of climate change. The series aims to educate Seacoast residents about their connection to the natural world and encourage action, both political and personal, to reduce carbon emissions and other types of pollution.